MSc in Interdisciplinary Biomedical Research. If you are thinking about doing a PhD but aren't completely sure, this Master's programme could be ideal for you. It provides a broad and balanced foundation of biomedical research skills, including knowledge and practical experience in other natural science disciplines that will enable you to undertake an interdisciplinary PhD project at the end of the course. You will attend modules in statistics, imaging, mathematical or molecular modelling, physical biology etc., plus a series of masterclasses led by experts in the areas of cellular dynamics, molecular microbiology and applied medical technologies. During the third term and summer terms you will conduct two eleven-week research projects in two different disciplines. For those interested in accessing PhD programmes following the MSc, tutors will help support your application by signposting funding opportunities and providing advice and guidance. WMS has bursaries worth 25% of course fees available for eligible students for 2019 entry. For details please contact the course team. 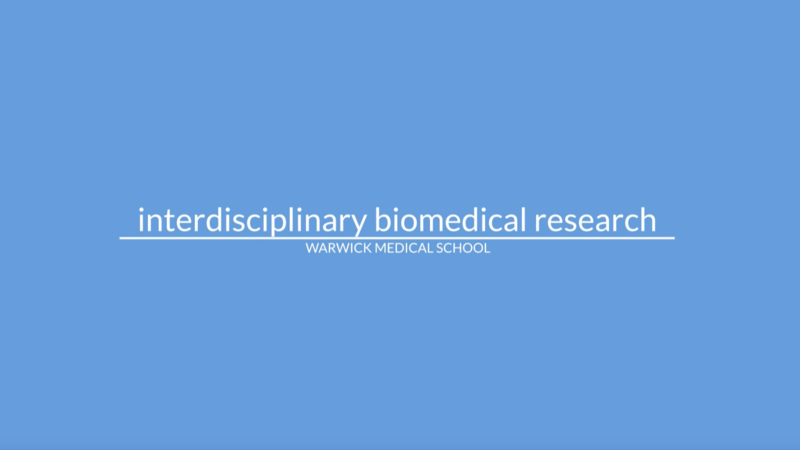 Why study Interdisciplinary Biomedical Research at Warwick? This course is unique in the UK in its interdisciplinary approach and cross-cohort training. It aims to provide knowledge in a broad range of biomedical sciences for students to acquire intellectual and practical multidisciplinary skills and pro-actively decide their future research expertise. Students are given the opportunity to learn about the latest research through the Division of Biomedical Science seminar series and the Molecular and Analytical Sciences seminar series. They also have the chance to gain experience in presenting their own research and will receive guidance and career advice throughout the year. The course is made up of six core modules and five additional optional modules. Those who have, or expect to gain, a strong 1st or an upper 2nd undergraduate degree (or equivalent) in Physical Sciences (e.g. Engineering, Physics, Chemistry, Computer Science, Mathematics, Statistics) or Life Sciences (e.g. Biology, Biochemistry, Biomedical Sciences) are eligible to apply. Maths A Level or equivalent is essential due to the level of quantitative biology undertaken on this course. We are looking for bright, talented and motivated individuals who are willing to make a real contribution to biomedical research at Warwick and beyond. You will be required to contribute around £2,500 for the year for the purchase of a laptop and consumables for your lab projects. English language requirements: Band A with specific component scores of 6.5 in reading and writing. Teaching is through lectures, seminars, practical workshops and laboratory-based research projects. The course is assessed in a number of ways, including reports, research projects, poster and oral presentations, and written and oral examinations. Find out more about what it's like being on the IBR course at Warwick in our student profiles.